2015 was an extremely crappy year for me, with many things seeming to go wrong I felt even more crappy than usual at New Years. That time of year is always a struggle for me as it is a period of forced reflection as my anxiety feels the need to highlight all of my failings and struggles throughout the past year. Coming into 2016 I wanted to try and combat that feeling that I experience every year by doing something about it. If you follow this blog you’ll know that I suffer from Bipolar and anxiety disorders and so the negative moods and low points are inevitable, it is all about changing my attitude and outlook to the situation by the end of the year. This is when I started my happiness jar. 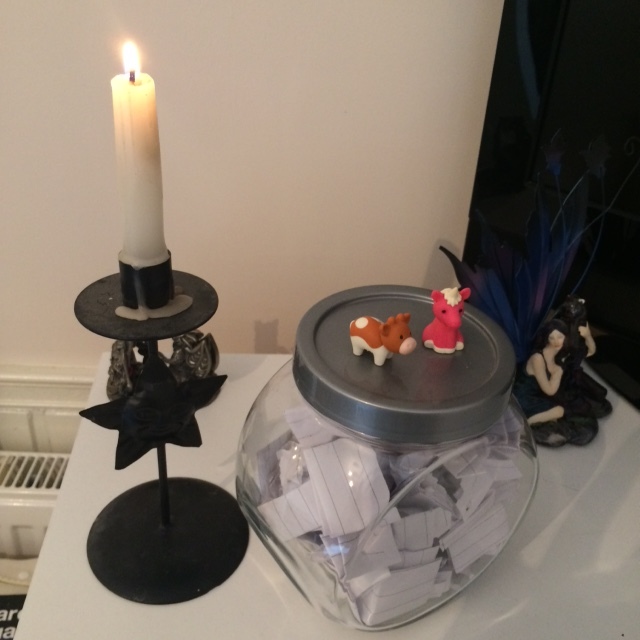 I got a cookie jar from Wilko’s and decided that every day I was going to write down at least one positive thing that had happened that day, or that had given me a reason to smile that day and place it into the jar. This means that by the end of the year I can look back through all of these moments to remind me that there were some good times, even if I cannot see them at that moment in time. Of course there have been days when I have forgotten or been away or too busy to find time (I have lazy days, I’m getting better!) but I have really found it beneficial. Even the process of just sitting down with my notepad to think through the events of the day to find the good in it has been really therapeutic for me. We all have days where we feel like nothing has gone right and it has just been a complete write off of misery and suffering (okay, maybe that’s my inner drama queen talking but you get the point!). However, being forced to find the good in days like this, and thinking about what has made you smile really does help! I find myself going to bed with a smile on my face most day now, even when the day has otherwise seemed pretty dark and hopeless. 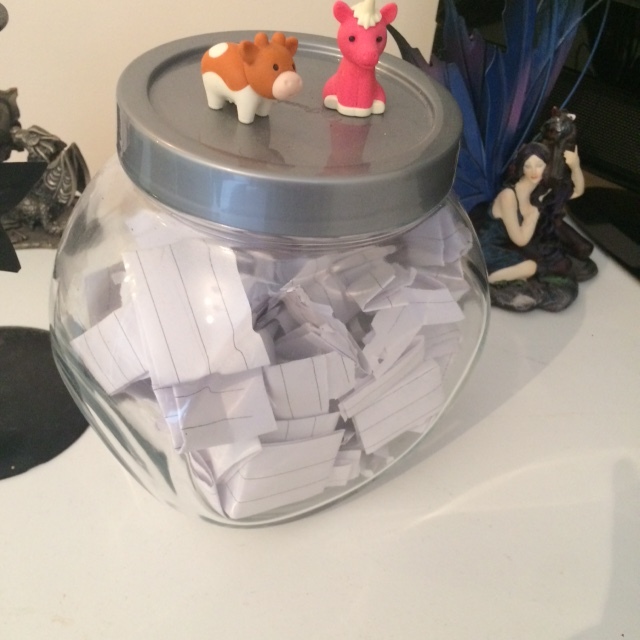 It has been so unbelievably tempting to take a look at the moments that I have already placed into the jar, however I have made sure to resist as I want it to be a complete surprise. I can’t wait to sit down in December and open my happiness jar to read through all these moments to relive my happy memories. It is a reminder to me that no matter how dark it seems there is always light somewhere, no matter how small that light is. It has really helped me to put things into perspective and if you are like me and suffer at New Year or Christmas time then I really would recommend starting your own happiness jar to keep a record of these little moments that make you smile. It is helping me to see that there are more people that love me surrounding me than I like to tell myself when I am down, and that really does help to get me through the day. So, if you are one of those lovely people, then thank you 🙂 you really do help! Great idea to bring a little sunshine into all of our lifes!